If you want a giant Mickey Mouse in your bathroom then you are in luck. 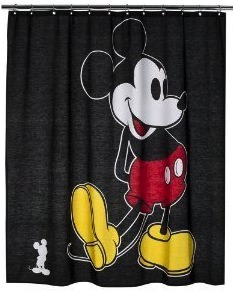 This shower curtain shows you a mickey that is almost 72″ high. Black is the background color of the curtain and that makes Mickey stand out nicely. And this is not a vinyl shower curtain, this one is made from 100% cotton and that means it will last way longer then those plastic once without the nasty chemicals.